The second week of October usually signals the beginning of the NHL season. Instead, it’s the American Hockey League that has the spotlight. The NHL lockout has forced numerous players to find a new rink to skate in overseas while others have migrated down to the AHL. The Providence Bruins have compiled a strong roster as they look to rebound on their 2011-12 campaign when their 35-34-3-4 record fell short of making the postseason. The P-Bruins benefit almost immediately from the offseason trade that sent Zach Hamill to the Capitals organization in return for 2011-12 AHL leading scorer Chris Bourque. The rest of Providence’s roster features a mix of new and returning Bruins, some of which would have been vying for a spot in Boston if a new CBA had been agreed upon between the NHL and its Players Association. The 2012-13 season should give fans of the AHL team an opportunity first-hand to see Bruins’ highly-touted prospects such as Jared Knight and Ryan Spooner along with NHL-experienced players like Bourque, Jordan Caron, and P-Bruins captain, Trent Whitfield. While the Providence Bruins may not play stacked, lockout-saturated teams such as the Oklahoma City Barons or Toronto Marlies, there are plenty of key games where fans will get to witness NHL-talent on the AHL-level. Plus, it’s professional hockey, automatically giving the AHL an advantage over the NHL…for now. Here are some key P-Bruins home games for the 2012-13 season. Ahh, opening night. A clean slate, a fresh start and every other stale new beginning metaphor you can imagine here. Aside from being the first taste of professional hockey in New England since last April, the P-Bruins kick off a season where they’ll be hosting the AHL All-Star Game for the first time since 1995. They’ll also get to face-off against a streaking-hot Manchester hockey team that went undefeated in the preseason. As the AHL-affiliate of the Los Angeles Kings, the Monarchs roster will feature both Slava Voynov and Jordan Nolan who dressed in all 20 of the team’s games in their 2012 Stanley Cup championship run. 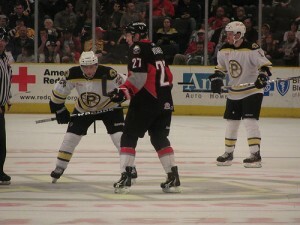 Bruins’ fans will also get to see Andrew Bodnarchuk in his new threads with the division rival. Bodnarchuk spent all of his four professional seasons in the Bruins organization, totaling 12 goals and 45 assists in 270 games with Providence. Of course you could also make the point that both of these teams’ NHL affiliate won the Cup in the past two seasons, which could lead to minor-league bragging rights similar to those of underachieving younger brothers, but we won’t go there. The new-wave nostalgia Connecticut Whale team make their first trip to Providence on the final day of November. As the AHL-affiliate of the New York Rangers, it’s possible to see NHL-ready players such as J.T. Miller, Dylan McIlrath and even BC-alum and postseason sensation Chris Kreider in the lineup. More importantly, it will be a game that Whale winger Ryan Bourque has circled on his calendar. This will be the first time that the Providence crowd will get to see the brothers Bourque face-off against one another since the Bruins acquired Chris in the offseason. For many fans, it’s an opportunity to see the sons of former Boston Bruin and Hall of Famer, Ray Bourque battle for loose pucks in the corner. While it may not be the first time Chris and Ryan Bourque have played against one another in the NHL, it’s the first time that the Bruins organization–the same that dear old dad played 21 seasons for–steps into focus for the sibling rivalry. The Bruins/Flyers rivalry has been alive for ages, evolving with more passion every year. If there isn’t an NHL season, the P-Bruins/Adirondack Phantoms will have some serious games to live up to. Of course, with an Adirondack roster stacked with some Philly mainstays such as Sean Couturier, Brayden Schenn and old pal Zac Rinaldo, these games might just live up to their billing. The Phantoms gain an excellent, two-way center in Couturier, one of the league’s top prospects in Schenn and over 232 penalty minutes and 15 NHL fights in Rinaldo. Much like the P-Bruins, the Phantoms, the AHL-affiliate of the Philadelphia Flyers struggled to miss the postseason last year but split their season series with Providence, 1-1. For as long as the NHL games are out of reach, expect the intensity to get a serious boost. The first and only Phantoms/Bruins game in Providence could be one of those instances. In a way, it’s fitting that the first Providence Bruins game of 2013 comes against one of their oldest divisional rivals. Since their relocation to Maine in the 1993-94 season, the Portland Pirates have had some of the most spirited games at the Dunk that I’ve personally ever seen. For me, this is the rivalry for Providence and it’s dated. In the mid-90s, it was frustrating to see Jim Carey stone-walling the Baby-B’s long before his NHL debut as much as it was fun to cheer against then-coach Barry Trotz. The Pirates/Bruins rivalry is defined by old-school New England division grudge matches. As much as the Springfield Falcons, Worcester Icecats Sharks and the now-defunct Lowell Lock Monsters Devils were the local rivals for the P-Bruins, the Pirates always stuck out. What better way to ring in the new year than with an old foe? You’re only as good as how you finish, right? The P-Bruins will close-out the regular season at home with their only meeting of the year against the 2012 Calder Cup Champion Norfolk Admirals, which is sort of weird since these players didn’t win the Cup. You see, the Admirals are now affiliated with the Anaheim Ducks and boast a roster of ducklings such as Emerson Etem, Devante Smith-Pelly and 2012 6th overall draft pick, Hampus Lindholm. When they hoisted the Calder Cup in June, they were Tampa Bay’s minor league affiliate. However, with location being an issue for the Lightning, farm systems were swapped and Tampa Bay’s minor leagues were assigned to the Syracuse Crunch with Anaheim’s moving to Norfolk. A straight up hockey trade, if you will. Regardless, the 76th and final game of the P-Bruins season will come against last season’s champions. What better way to close out the year then to beat last season’s best team in the AHL? It’ll be an interesting year in the AHL.